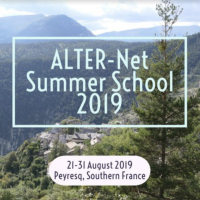 The ALTER-Net Summer Schools provide an unparalleled atmosphere for contemplating sustainability challenges–and confronting those challenges with innovative, interdisciplinary scientific approaches. Registration for our 14th annual Summer School is now open. The Summer School is a unique opportunity for intensive study of the science, policy, and practice of European biodiversity and ecosystem services–with the stunning surroundings of the Haute-de-Provence Alps as a backdrop.